I was the bugler at Camp Seabow Mrs.Dietz and Mrs Armon were directors(oh and Barb)I went in the 60′s and 70′s .I love not being to safe and never sorry.I woke many a time with a wild boar staring at us in our cot in the open camp or a Momma boar and her little piglets on the Mt.side as we rushed down to swim in the river. Ilove(loved) Camp SEABOW.It shaped my entire life and is still an influence on my Childrens life. Are you Ann that liked white sox? I went to camp Seabow above Laytonville ca. for13 summers as a camper C.I.T. and counselor. Who are you? I loved Camp Seabow. For some reason the walk up the hill from the swimming hole stands out in my mind. There was a friendly old black & white collie that hung around the craft shack half way up the hill. I loved the buttered toast snacks in the afternoons. The flag ceremonies in the morning and evening. Good times. you are thee barb huh?!!!!!!! I also went to Seabow. I remember you both. Just reread my comments…. the lower shower house used to be a “haunted house”[not "cookhouse transformation"]. You know, for a little boy[me]to accompany his mother each summer to a girl’s camp seems pretty weird to me now, but it’s not like I had a choice. There were probably a lot of girls who questioned/resented it, as well, but…Seabow made a lot of powerful impressions on me and[though I know it's impossible and Seabow as WE knew it no longer exists]I’m happy I got to be there…graduating to Camp Ravencliff[up by Garberville]for 5 consecutive summers. Nowadays, neither camp could function as it did “back then.” But I think we’d all agree that those experiences really did shape who and what we’ve become. Tom – What a joy it was to read your comments. I adored your mother and I was saddened and sorry to read about her passing not too long ago — please accept my condolences. Your experience at Seabow was unique, to be sure; however, I’m deeply honored that you shared your memories here. If you’re on Facebook, there is a very small Camp Seabow page which someone has initiated — I’m hopeful that over the years it will grow in membership as more FB users discover it. Thank you again for writing, and remembering with us! What fun to remember some of the best time. I am always tempted to crash the gate when I drive up 101 to see what is actually there. It was such a great part of the community and provided opportunities for kids. I remember several kids who were there on scholarship through the work of Beverly. I don’t remember the wild boars but i do remember the “cave” for counselors and upper and lower snob hill–i still don’t remember what they were changed to but they will always be snob hill in my memory. Nothing can exist as it did in the past but that is what time means–changes. It is how we adjust to the changes that matters. My sister and I were reminiscing about our summers at Camp Seabow. We were singing the camp songs to each other over the phone too. We went 4 summers and we both have such fond memories. The smell of things cooking and the building its self where we would sit and eat. I loved eating breakfast in the early mornings. The arts and crafts projects and how we both learned how to make belts and key chains out of lacing. I could go on and on about all of our fond memories. I wish I could find pictures of the Camp. Paula, what years did you attend? I attended between about 1962 an 1967 (ages 10 through 15). My sister, Linda Clark, and I used to stay for four weeks every summer so Camp Seabow was a huge part of my life. I desperately wish I had photos of each and every site: the swimming hole, Mrs. Armand’s cabin, the lower campground, the cookhouse and surrounding area, the first campground at the top of the hill, the higher campgrounds (Sweetheart, Strongheart) and, of course, the campfire area. Funny, I don’t ever remember having a camera at Camp Seabow. Young kids just didn’t carry them the way kids do these days; they weren’t as ubiquitous. Hi Ann…thanks for responding…..I went to Camp Seabow in the early 50′s….I’ll have to get out scrapbook and find the letters I sent home. But, reading some of the stuff from people who attended brought back wonderful memories. I too wish I had photos of the swiming hole….I would love to read Mrs. Armands obit…I guess it gives out a lot of info about her life up there at camp…. Jan, Hi! You were from El Cerrito? It’s Della (then Smith), formerly of Richmond. I remember that Bugle and the many flag-raising mornings! I read recently that Camp Seabow was sold for $565K. That was always my dream … to buy it and turn it into a church camp. Just wish I had followed through on saving and watching for it to be available. A Camp Seabow reunion is in the works! Scheduled now for May 19-20, place to be announced. For more info go to Facebook-search Camp Seabow and join us! I also attended Camp Seabow through the camp fire Org.,my memories are very fond but i can remember being homesick. I had two older sisters (Judy and Joan) I remember the counselors would try to calm me down but it was so bad they would alternate taking me to see judy one day than joan the next, worked for a temp. solution but I remember my parents driving up to consule me. I thought they were coming up to take me home but after the visit they drove off without me. I also all the activities (tye-dye, swimming, sand candles, making cards, key chains) sitting around the campfire singing and yes also enjoyed the flag in the a.m./p.m. I also enjoyed going to the canteen shack. I’m 51 now and I belive my sisters and I attended in the summers of 1968-1970. Since then I have lost my parents and older sister but I have three children all grown up and every chance I get I tell them the great experiences I had as a child and going away to camp. I just felt the need to share maybe someone might rememmber me……. Hi Laura – thank you so much for writing and sharing your memories. Yes, I remember that homesickness was very much a part of the camp experience for many of us. If you don’t already know, there is a Camp Seabow page on Facebook where we are all gathering to reminisce, recollect, and share photos — there was even a reunion held on Angel Island this summer! The Seabow page is a great place to post your bio and ask if anyone remembers being there when you were there. I hope to see you on Facebook! I cherish my memories of Camp Seabow-such wonderful times I had there! I still remember Mrs.Armand brushing Sam’s teeth. He would pull his lips back and stay perfectly still while she brushed them. What a great dog! Sleeping under the stars was an amazing experience and so many kids miss out on that since camp usually means sleeping in cabins or tents these days. I learned how to whistle with two fingers while at camp Seabow. Several of us took an early morning hike with one of the counselors, who unfortunately twisted (broke? )her ankle and could not walk back to camp. We could hear the singing around the morning campfire from where we were, so we whistled until someone heard us. Sitting on that hill, trying to get help, I learned to whistle extremely loud and am still proud of my talent at age 62 (smile). It’s so nice to read others memories of that magical place and time….. It is so wonderful to read everyone’s memories of our beloved Camp Seabow. 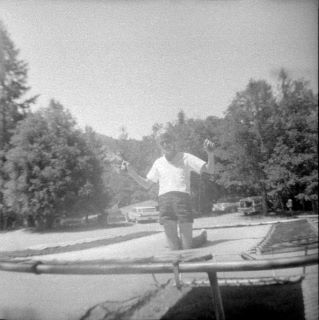 I started going to camp in 1958 for several years. Going to camp was the highlight of summer. Never did my sister, Cheri Odom , Nancy Wascoe, or me ever feel homesick while at camp, that started as we left to go home. Swimming classes, King Neptune and the cold spaghetti noodles, Saint Mrs. Armand and her morning flag raising with the leaves of wisdom. Sammy her collie,Craft time glue and Popsicle sticks. Camp.fire sing-a-longs.,Church on Sunday, the wild boors, the haunted house, the canteen candy, mail time, camp inspection, the smell of oilcloth, sleeping under the stars on cots,the camp ceremony when we wore our Bluebird or Campfire girls finery, the smell of the dust. cold toast after swimming, the showers. and of course our shorts.shoes,and tops(required fashion), just to name a few. Oh and don’t forget the long drive up with lunch in Ukiah and crossing the creeks to reach our final destination. It would be great to go back. The camp and the counselors really made a impression on my life. I will cherish my memories forever. I have lived in Illinois for 11 years now. Today my co-workers were talking about getting their orders of Girl Scout cookies. I proudly told them I was a Campfire Girl and we had the best mints ever. That conversation got me reminiscing about Camp Seabow as I had so many times before, over the last 45 years. My very first memory of Camp Seabow in addition to the excitement of finally getting there was after our bus parked. I got out of the bus and as I walked towards camp, what I remember most is the smell of the weeds as my little feet walked through them, it was so sweet. If I close my eyes and just breathe, I can still remember the fragrance that was in the air. My sisters and I continued to go to camp for the next 3 summers. I was so happy when I came across this site to be able to read about all my summer memories as a child. From “Oh how I hate to get up in the morning”, it was the only time it was ok to say I was going to murder someone (sorry Jan), to “…side stroke, breast stroke, fancy diving too, oh don’t you wish you didn’t have anything else to do. Hi Jeanette – Thank you for your lovely note! If you are on Facebook, there is a Camp Seabow page for former campers; there was even a reunion last year, with more planned in the future. Please stay in touch. Seabow rules! I remember a lot of the things you all are reminiscing about but a few I recall are very different. I remember the first day or two we all had to go to the nurse cabin and weigh in. My best friend and I were average kids, we weighed maybe 80 pounds. But a few girls in our group were of a different race and a lot more developed and that was the first time we had ever heard of someone our age weighing over 100. We were just in awe, wow, 100. Another memory was my best friend and I having NO CLUE what was being recited down by the flag pole in the morning. We thought we were smart kids and were so perplexed that EVERYONE else knew the mantra thing but we had never heard it. Turns out it was the Lord’s Prayer. We were from atheist type Berkeley families and had had zero exposure to that kind of thing. Finally, I remember our counselor crying so sadly one night. She finally told us she had just found out her boyfriend had been killed in Vietnam. We were just little, little kids and we hugged her tons and hoped it would make her feel better, we were pretty naive. Oh, finally, I remember Camp Seabow was probably the first white bread we had ever eaten, we always had dark bread in Berkeley. My sister and I are on a train in Texas traveling to San Antonio talking about Camp Seabow. So happy there will be a reunion that we can attend sometime in the future. We will keep watching the Facebook page for Dates. Some of my sisters memories include we are climbing Jacob’s Ladder as a processional, snipe hunting, the councelors and their ukulele, swimming in a circle forever to get our patch,long hot walk up the hill, the walk in the year the buses could not cross the creek, our family going in th early to do camp setup. all of us got poison oak that time. Thanks for the memories keep it up!